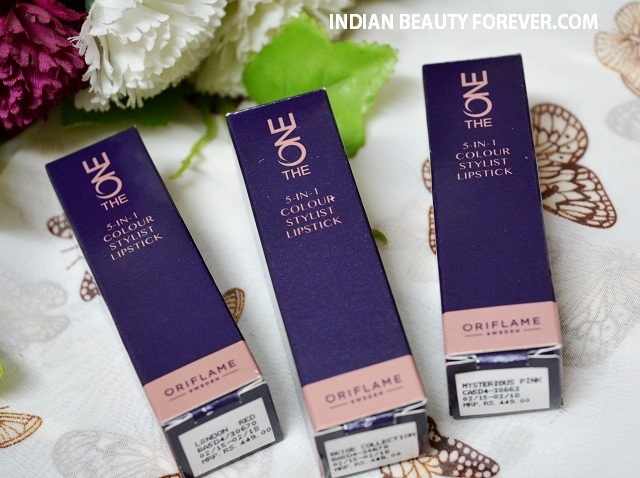 Today’s post is about oriflame lipstick swatches, I will review the newly launched Oriflame 5 in 1 Colour stylish Lipsticks from The ONE collection. 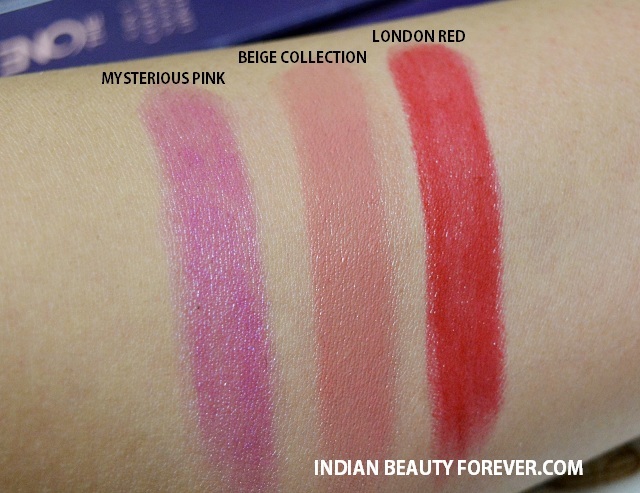 I will review 3 of these in the colors London Red, Mysterious Pink and Beige Collection. 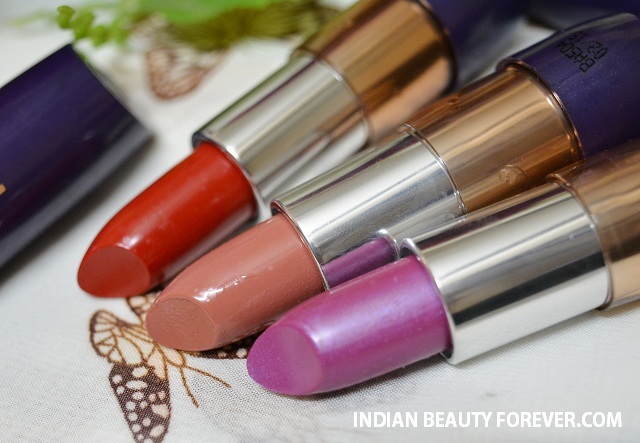 Price: Each of these lipsticks cost rupees 449 and are available in 18 plus shades. These lipsticks come in an outer case and these lipsticks have a purplish blue packaging which is pretty and cute looking. Inside that if you will see there is an orangish silver detailing. Packaging wise, I liked the range but would have loved if there were some transparency in certain parts on the packaging so that it would have been easier to locate the colors. Formula is good and is very creamy. I like creamy lipstick with matte finish but these have creamy finish with slight glossiness when I use them. 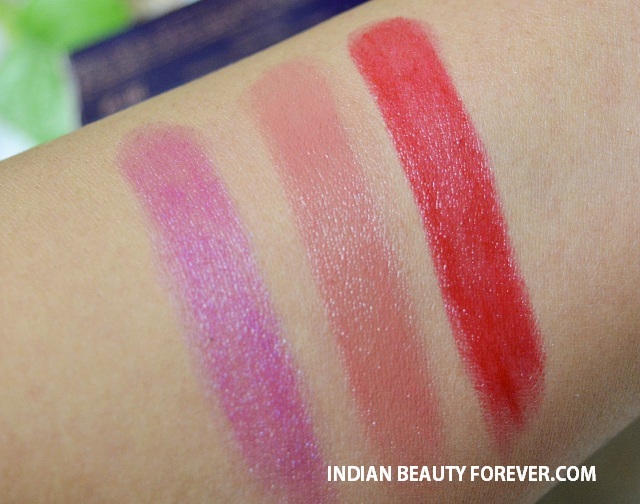 By the way, creamy formula also keeps the lips softer and helps with the dryness. 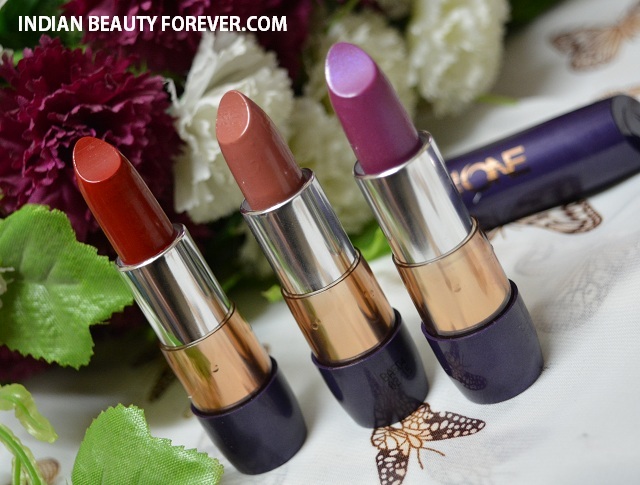 I really don’t need the lip balms before applying these lipsticks. I feel that the color feathers a bit from the outer corners of the mouth but I can manage that with the help of a lip liner. The pigmentation is decent, as in order to get a good opaque finish. It would have to swipe 2-3 times therefore they are not heavily pigmented lipsticks but has a beautiful light weight finish. These can be used as a single swipe just for a subtle hint of color which is not easy with the highly pigmented lipstick. I Like both types of formula very highly pigmented and sheer glossy pigmentation as they both have their own set of pros and cons. Coming back to the lipsticks. They will stay on my lips for 3-4 hours and reapplication is required once they fade which don’t mind. In short the lipsticks are very good for the price and formula especially for the girls who have dry lips or who wants some glossiness on the lips. 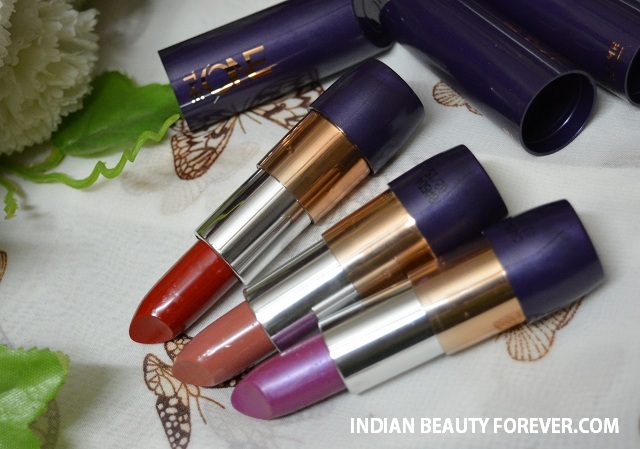 These lipsticks bears a subtle smell which is pleasant yet goes within minutes. Let me start with the shade description. Mysterious Pink: Mysterious Pink is a mauvy pink color which will cater to the girls who like such mauvy shades. I think dusky skin toned girls can carry such shades beautifully and these shades can actually compliment their skin color but this is not for men, my complexion looks really dull with such colors. London Red: Now, this is my kinda shade. Its true red with a creamy finish. I like using it as a soft stain or in its full intensity. This is a color which would be loved by the red lipstick lovers. Beige Collection: Beige or such neutral colors are very difficult to pull off, at least not for me as it makes my complexion looks really dull and weird with such colors but on the upside this is a color for those who like to use neutral lip colors. It has soft warmth which is why it is not too beigish. Rating: On the whole, I will give these 4 on 5 for the range as they have the similar formula and texture it’s only the color that differs and that is completely a thing of preference. The reds from this collection are very good with varied shades of red which you should see once an hopefully you will find your type of red. I like beige collection, its quite neutral and wearable ! 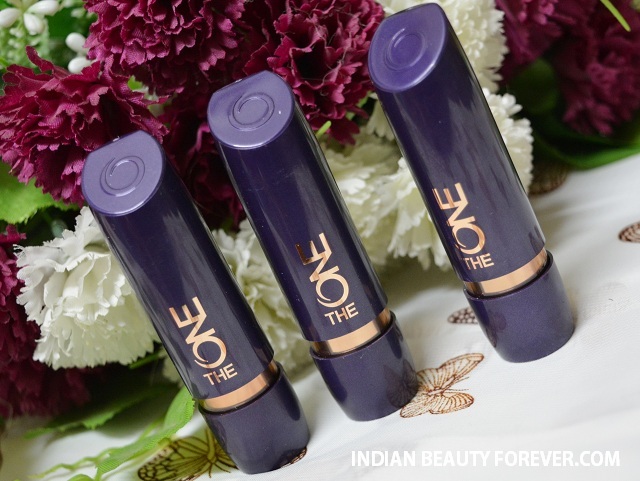 I haven't tried any products from Oriflame but I'd love to try Beige Collection!